The planing for the first Lebuffet Kids‘ Restaurant in the Karstadt department store in Cologne began with a creative workshop. The future users – children aged 6+ – gathered first ideas for their paradise land. 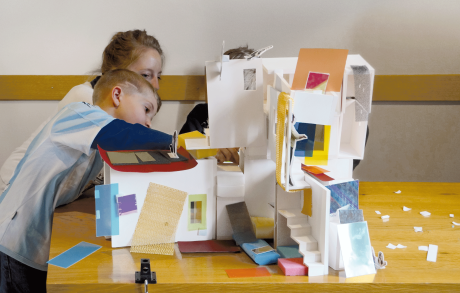 From the Children’s desired worlds, they built together for the Le Buffet Restaurant room-modules with mirrored-elements, coloured-foils, and material samples. They researched the potentials of each module and their relationships with one another in order to arrange them to their tastes and to activate them with light and material. The entire process was scientifically monitored and evaluated by the project „Designing with Children“, from the University of Sheffield.